Over The Top! includes four great battles from the First World War. These battles simulate WWI warfare from attritional trench fighting to maneuver, tank assaults and infiltration tactics. Units are regimental-brigade level with corps level HQ and support. 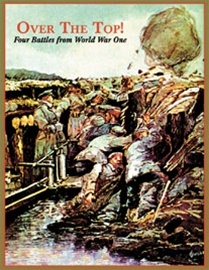 Brusilov Offensive, 1916. The Russian army fights its way through the Central Powers' trench system only to be stopped by a desperate German counterattack. Riga, 1917. German "shocktroop" divisions break through the Russian line using special infiltration (Stosstrupen) tactics to knock Russia out of the war! 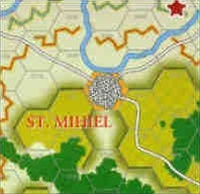 St. Mihiel, 1918. The new American army, utilizing tanks and mobile warfare, overrun the greatest German salient on the Front. The battle that started George S. Patton's career! Damascus, 1918. British Gen. Allenby, with assistance from Lawrence of Arabia, surprises and outmaneuvers the Ottoman army in the Middle East.